Blogger? This is a chance to win roundtrip tickets to Kuala Lumpur, Kota Kinabalu, Shanghai or Incheon! To join, start by creating a blogpost answering, "What's your destination wishlist?" from a list of locations. There are several more things to follow so do make sure to read up on the mechanics. They would need your Nuffnang Philippines email. You have until October 25, 2013! 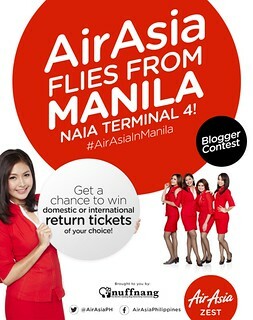 Click here to join the Nuffnang Philippines AirAsia Zest in Manila Right Way to Fly Contest.